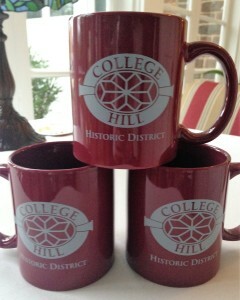 The College Hill Neighborhood Association is selling these very handsome College Hill mugs! They’re going for $10 a piece, but we have a limited quantity. Want one? Send an e-mail to CHNAgso@gmail.com to reserve yours. 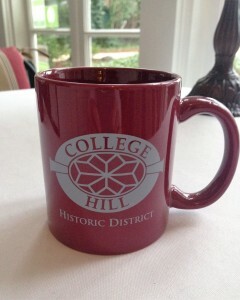 You can pay (cash or check) and pick yours up at the next CHNA meeting (7 p.m., Monday, March 28 at the Church of the Covenant, 501 S. Mendenhall), OR send us your address and one of our lovely board members can hand deliver it to you. Proceeds will go toward organizational costs of the neighborhood association. 1. Do you want a mug? Of course you do! 2. Send us an email at CHNAgso@gmail.com. 3. Tell us whether you’ll pick it up at the next meeting on 3/28, OR whether you’d like a hand-delivery from a friendly neighbor.